What a week for our show and for our writers. It’s been an absolute pleasure to watch as Garrett Frawley, Brian Turner, Gretchen Enders and Aminta Goyel were recognized for their work on Gortimer Gibbon’s Life on Normal Street. When you’ve been in the trenches with these people, when you’ve fought alongside them to make something truly unique and authentic, when you’ve held the line against compromise and held each other up so you could reach just that much further than any kid show has ever gone before, then seeing their efforts rewarded means so much more. It’s been a privilege to be in the room with these writers. They haven’t just made our show richer, they have defined our show, become part of its DNA. I’m beyond thrilled for them. Brian demonstrates how to eat a giant, invisible calzone. 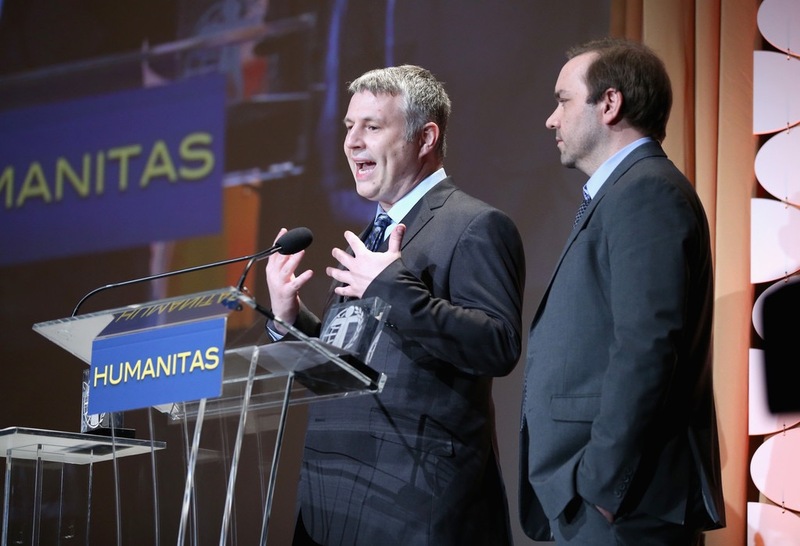 The Humanitas Prize is a huge honor and recognizes writers who illuminate and celebrate our common humanity with their writing. There have been years when no prizes were awarded in the children’s category. This year, two episodes from our show were finalists. Gretchen Enders was nominated for her episode “Ranger and the Legend of Pendragon’s Gavel,” and Garrett Frawley and Brian Turner won for “Gortimer and the Surprise Signature”. Brian and Garrett are a writing team and have been with the show from the beginning of the first season, when we got the green light for the series. They were best known for their TV movies Santa Baby and its sequel, and Snow Globe. Their first episode was the first episode of the new series, “Gortimer vs. the Mobile of Misfortune”. No pressure! Much was riding on that script because it was basically proof of concept — the pilot was a smash hit but could we actually make a series? Could we continue to create stories with quirk and charm? Could we recapture the unique voices of Gortimer, Ranger and Mel? It’s easy to take it for granted now, but at the time it felt like a very small target. It’s no spoiler to say, of course, that thanks to Brian and Garrett the show got off to a great start. “Mobile” continued the magic and the friendship and introduced us to the sweet, charming and funny Stanley, endearingly played by David Bloom. Brian and Garrett were nominated as finalists for both the Humanitas Prize and the WGA Award for the same script, and it’s easy to see why. “Gortimer and the Surprise Signature” is just a great pitch to begin with: After having his cast signed by his friends at school, Gortimer finds one name he doesn’t recognize. But how is it possible to have someone sign your cast without you knowing? “Signature” is a fun episode, a great mystery, and a heartfelt investigation of the difference between shyness and introversion that shows not all who shun the spotlight need to be shoved into it. And again, Brian and Garrett introduce us to another continuing character, one who will become Gortimer’s first love, the enigmatic Abigail Arroyo, delightfully played by Coco Grayson. I’m not sure you ever really saw me. I thought if people knew about you, it would make things better. Gortimer turns to find Abigail standing before him. Better than what? I’m not like you. I don’t like being the center of attention. But don’t you want everyone to see your art? They do see my art. I’m not hiding it. I put it all over the place. But there’s a difference between what I do and who I am. It takes courage to be a writer, and what strikes me most about Aminta and Gretchen is their courage. They are fearless when it comes to advocating for their stories and doing what it takes to make their scripts shine. Their reward is well-earned. Gretchen was also with us from the start and jumped into the “Gortimer Gets Shushed” script, turning a fanciful pitch about a phantom bookmobile into something delightfully dark, mysterious, strangely whimsical and ultimately poignant and touching — just as a Gortimer episode should be. Her Humanitas-nominated script for “Gavel” is an inspired take on Arthurian legend that asks us to think about our relationship to power and what happens when everyone suddenly gives you your way. Aminta joined the writers room for the second season and we were so very lucky to have her. She is an alumna of the Nickelodeon Writing Program and possess a wonderful sense of myth and folktale which lends itself perfectly to the rich world of kid lore in Gortimer. Some great fun awaits in Season 2B – wish I could say more! 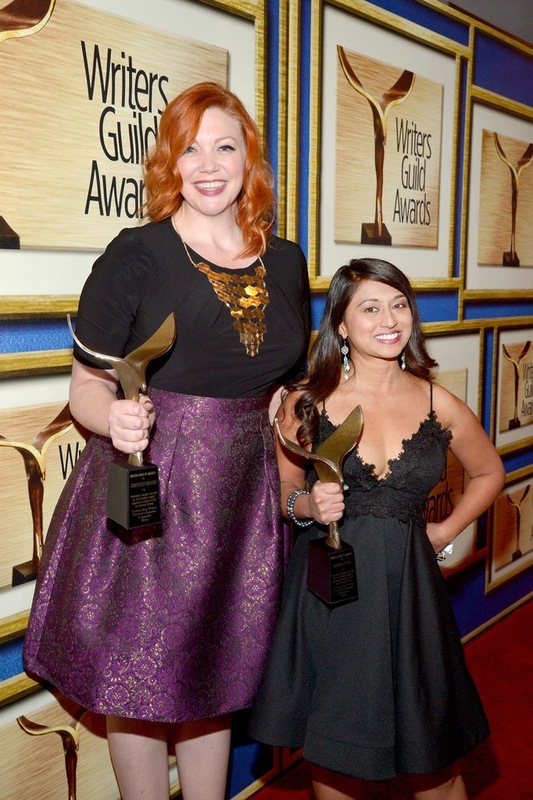 Aminta and Gretchen shared an office and it seemed like destiny they should write the Season 2A finale together. This was a deceptively challenging episode in which our three characters are stuck in a time loop. How do you keep that story alive and interesting? Gretchen and Aminta do it by gently uncovering the true heart of our characters, exposing their worries and fears, allowing them to be vulnerable and finally to find their strength in themselves and each other. “Endless Night” is a hauntingly beautiful episode, a gentle exhalation of breath after the emotionally tumultuous events of previous episodes. What our characters needed most was a quiet time together for reflection, and I think perhaps more than any other episode, “Endless Night” completely encapsulates what our show is really about. It still brings me to tears whenever I watch it. I consider it an incredible gift from two very talented writers. Life is only going to get harder if we go back. But if we stay here we never have to deal with death or sadness or change. It used to be easier. Mel and Gortimer embrace Ranger. Staying here doesn’t mean we won’t ever be sad. My mom is still gone. The pain still exists. We’ve just been distracting ourselves and you can only do that for so long. But there’s no guarantee that we’re gonna be okay out there. We don’t know what’s gonna happen in ninth grade. No, but we’ll be together. Really?! We used to be together all the time. And now, I mean, I had to draw up master plans just to get you both to come out here. That never would’ve happened before. I just want things to go back to normal. Yeah, and we’ll go through ups and downs… but we’re always us. I could not be prouder of these talented writers along with the entire Gortimer Team. Love you all. Congratulations. Way to go, Dave. I’m so happy for you. Well-earned awards, indeed! Congratulations and now I see the mention of Season 2B, I am over the moon that I can look forward to returning to Normal Street again! When will 2B be released? Can hardly wait! We actually just finished in post. Amazon hasn’t announced an official date yet, but we’re closing in. Hang in there! My kids and I just finished watching season 202 and it was amazing. I love this show so much. Please, please, please tell us this wasn’t a series finale. I felt like it should have been called “Jennifer, Max, and Josie vs. The End” because we were all so sad at the thought! PS. I am 47 years old and this is my favorite TV show. That’s a testament to the enchanting universe you created and the beautiful writing, acting, music….all of it. It’s perfect. Thank you, Jennifer. Everyone involved in the production gave it their all and it really showed. Our composer Sasha Gordon is probably the unsung hero of the show — her work is so essential in defining the essence of Normal Street. Thank you for your kind response. My son (who is 7) kept telling me it was the end but I was in complete denial. Now that I have come to terms with it I really appreciate the creative decision to end the show as a lovely experience of childhood, rather than evolving it as Gortimer, Mel and Ranger move into high school and beyond. The animation of the future was really a perfect way to get closure. Last night I had that same thought: At least we can visit Normal Street whenever we want! And yes, Sasha Gordon is an incredible talent; her gorgeous music always plays in my mind for days after watching an episode. I can’t wait to see what you come up with next. Thanks again! Here’s to ending on a high note!